Discussion in 'News & Events' started by Locky, Nov 19, 2018. 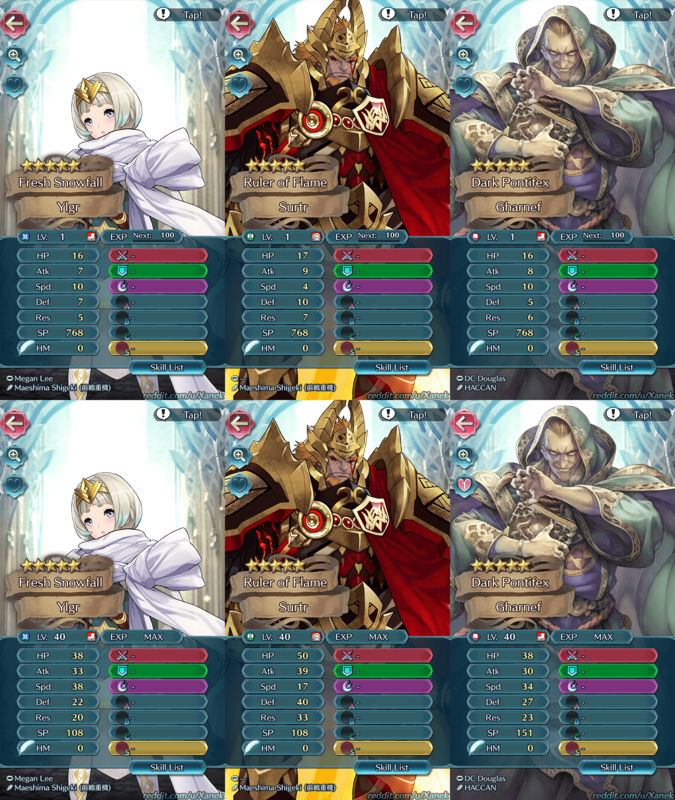 As if we didn't have enough no-demotion banners, here comes the 5th one with just two units! Surtr is trash, Ylgr is dumb, but if you wanted to snipe ANY 5* exclusive to make +10, just having two focus units, and one of them being green, makes it the best time to do so! Sorcery Blade 3 : at start of combat, if unit is adjacent to magic ally, deal adaptive damage and target the lower of def or res. Steady Stance 4 : Basically steady stance 3 and Guard 3 had a baby who ditched the stupid HP requirement. Gharnef's tome is Imhullu: Grants Res+3. At the start of turn 3, deals 5 damage to non-magic foes within 5 columns centered on unit, and inflicts status on those foes preventing counterattacks through their next actions. Gharnef gives Mirror Stance 2 at 4*, Chill Atk 3 at 5*. Sorcery Blade is really fun in player hands but the AI would be awful at combo-ing it. to be fair, most units who do use Guard are enemy phase units with only a few exceptions. You can blame the Nordic men who made those names that so many JRPGs like to use.